I don’t consider myself anything close to a sports fan, but even I understand that the Lord of the Flies-level chaos that transpired following Texas Tech’s victory over Michigan State on Saturday is remarkable if for no other reason than the bonfire of flaming Lime scooters. 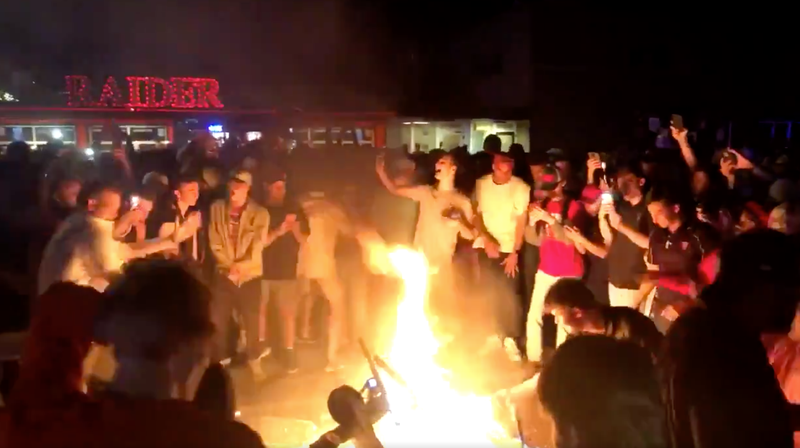 Video shared to Facebook and Twitter following Saturday’s NCAA game captured crowds in Lubbock, where Texas Tech is based, setting fire to Lime scooters and destroying other private and public property. The destruction was such that ahead of Monday’s Red Raiders Men’s National Championship basketball game against the University of Virginia, Lime told TechCrunch that it yanked its entire fleet of e-scooters from Lubbock’s streets. Lime told TechCrunch that it planned to “re-deploy scooters after activities subside early Tuesday morning.” TechCrunch said it wasn’t clear how many scooters were pulled from the area. Lime, which launched its e-scooter program in Lubbock last year, did not immediately return Gizmodo’s request for comment about the incident. The destruction by riotous college students over the weekend was not limited to blazing e-scooters. Our sister site Deadspin reported Sunday that the chaos also included flipping a car and destroying what appears to be a street light. The scene was decidedly less wild on Monday following Texas Tech’s loss to UVA’s Cavaliers, which from what I understand is currently being blamed on a Ted Cruz curse. And honestly, even as a non-sports fan, that scans.